Article originally appeared in Macon&apos;s The Telegraph. A furnished room is not complete without lighting and accessories. The juxtaposition of colors, textures and shapes creates a space that is appealing to the senses. To walk into a room that grabs your attention makes you want to continue to explore the next room and the next. Suppose you approached the design of your garden with the same consideration, arranging the plants as you would decorate the rooms in your home, developing spaces that would pique the curiosity of the visitor and invite exploration. 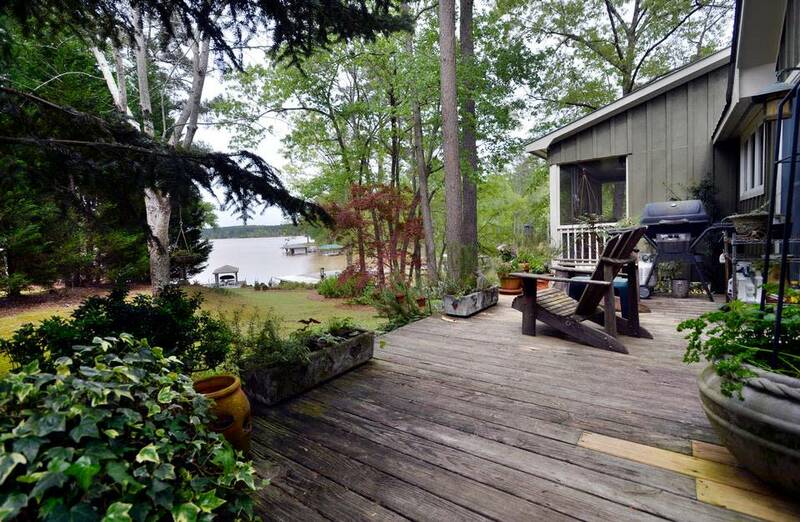 Susan Huellemeier, who lives on Lake Sinclair with her husband, Bobby, has spent any snippet of leisure time during the last 20 years landscaping the enclosed garden at the entrance and the gentle slope to the lake, a vista they can see from any room in the cottage. Built in 1996, by the late Frank Kern, the lake house is a testament to Susan&apos;s artistic vision of a house that would not look new, but as if it had been lived in and cherished for years. All of the walls are wide plank old pine, some left in its natural state and sealed, other walls pickled in a milky glaze to reflect light in the dark spaces. The exterior stain blends with the bark of old trees, which permitted this interloper to nest below their branches. Susan was determined that no valuable trees would be felled, a challenge to the builder entrusted with the task of building around and amongst them. Susan and Bobby graduated from Mercer University with art degrees in 1971, went their separate ways, and reconnected six years ago. She has retired from a successful career in the communications industry and has rekindled her interest in landscaping, a field in which she was involved years ago. He is the renaissance man who specializes in restorative preservation of old houses, maintains a privately owned train car, can see a sculptural form in the oddest of discarded trash and still enjoys drawing and painting. 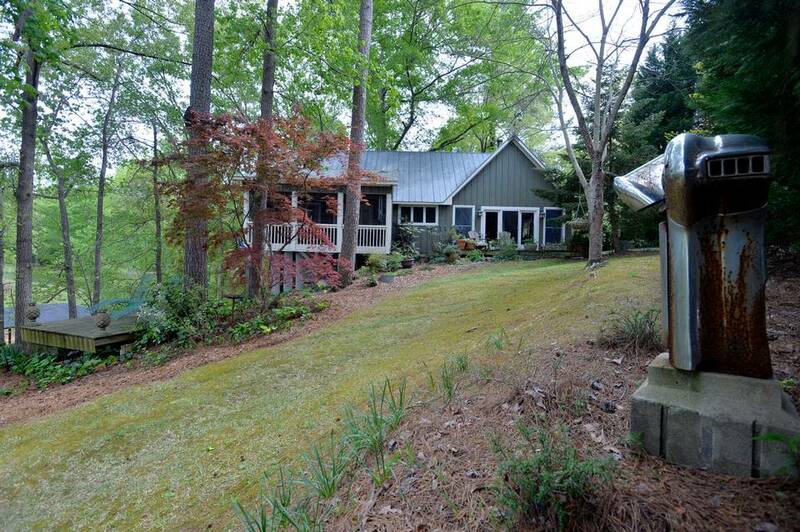 After their marriage in fall 2012, Susan turned the boat house over to her husband to convert to an office/studio. The Huellemeier home, barely visible from the street, is at the end of a short path from the gate, which is located under a bower of profuse, white and yellow Lady Banksiae roses. Bobby found the hand-forged old gate, fashioned the stanchions to hold its narrow frame and installed it between the fences. 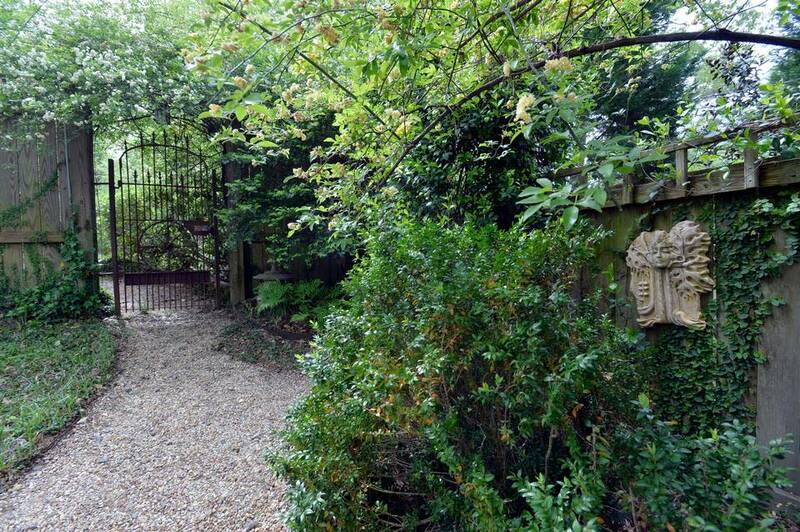 Surrounding the private garden, the wood fence and the gate add not only textural interest to the garden, but a sense of anticipation for what lies beyond. 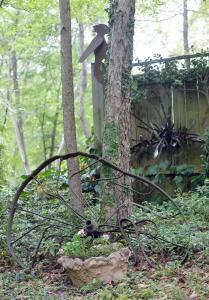 Bobby&apos;s proclivity for transforming the ordinary into art is evidenced throughout the garden. 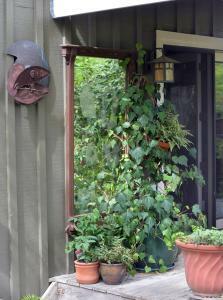 On the porch, propped beside the front door, is a vintage pier mirror that reflects the garden behind you, framing a vignette of shrubbery with herbs and perennial ferns tucked beneath the dense foliage. The garden&apos;s border of unusual, long clay blocks, found in a shuttered mill, are glazed in a soft doeskin that blends well with the walkway&apos;s river pebbles and meanders from the gate to the front door. Susan is averse to square gardens, unless you count the raised beds tucked near the porch for herbs Bobby might need in the kitchen. The sinuous borders of shrubbery and bedding plants sweep in broad curves, down the grass and moss covered lawn toward the water. Nikko blue hydrangeas are not in bloom yet, but the lush leaves are the backdrop for fatsia, dwarf compacta hollies and creeping rosemary. On an embankment, opposite the beds, a widow&apos;s peak of African daffodils will soon burst into color in this biosphere that stays a little cooler than the city. Large conifers serve as a privacy hedge, their dark green foliage accented with one of Bobby&apos;s contemporary sculptures, molded from chrome pieces of automobile trim that have seen better days. Tucked under the Japanese maples in the border gardens, and in the private entry garden, are birdbaths that were once the concave harrow blades for tilling the fields. Collages of plants and sculpture are an integral part of the landscape design, evolving, as a garden does, with growth and with the addition of new specimens. There are surprises in store as you move from one area to another -- a clay image of the goddess of the garden is barely visible behind the Lady Banksiae that have gloriously canopied the gate. At water&apos;s edge, draped over the seawall, a row of wild violet wisteria nods in the wind, kept in check to ensure it does not climb the trees behind it. The lake is still murky, roiled by the recent rains. However, the view from the water, with the wisteria blooms in the foreground and the greenery behind it, is worthy of an impressionist&apos;s painting. Susan, with her painterly eye, looked at the raw land as another canvas and has placed the plants and the accessories to complement the whole. It will forever remain the unfinished canvas, for she finds new plants that are incorporated into another setting, continually enhancing the view from the house. Susan and Bobby have partnered in a new venture, Elemental Thought, a landscape design service that recommends the use of other natural elements as garden accessories. Susan is adamant about hand trimming and does not own a pair of electric shears. Even the first plants at the edge of the street, installed almost 20 years ago by landscape designer Darrell Floyd, are cared for by hand, despite their age and size. Floyd, who is not crazy about the current trend in square and round balls of shrubbery, would be pleased. Bobby&apos;s calendar is full of his woodworking projects -- cabinets, decorative trim and outdoor furniture for clients. He has recently built mini-libraries, one for the grounds of Andalusia, the late Flannery O&apos;Connor&apos;s estate, the other for downtown Milledgeville. Additionally, his waist-high library desks are in the public rooms of O&apos;Connor&apos;s house for visiting researchers to use. In addition to overseeing all the maintenance for the private train car, Bobby, an accomplished chef, is in charge of the menus and food preparation for the owner. Since that position is seasonal, he spends most of his time interpreting clients&apos; ideas for unique items he creates in his work shop. To see more of the Huellemeiers&apos; talent, visit www.elementalthought.com. Photography credit to Beau Cabell, contact at bcabell@macon.com.